Okay, we have a Frequency List (Memory) in the TRX-Control Window with M+ and M- Buttons, but it would be nice, to have a direct Access to the List for changing faster to a Frequency in the List. A Description Field in the List would be nice too and, maybe, support for more than one Frequency List? Other wishes are good, but not implemented. In test version 2.30-104 I have added an indicator that shows the current memory line when pressing up and dn buttons. And i use the Beta's a lot. I made a test version 230-106 where you can set rig by double clicking TRXControl's Add/Modify memory list. You may find it comfortable with SWL Broadcast listening. As a, in German we say "Sahnehäubchen", the Description could be shown beneath the Frequency in the TRX Control Window. This quick solution was made just the BC broadcast listening in mind. I am aware that keeping Add/Modify memory list open blocks other functions you need for logging ham qsos. It was just a Sunday afternoon project. Also description column addition is not so easy. For some reason I did not manage to do additional column even for row number for list that is not kept in mysql, just created at window opening phase. Adding a description would need also mysql database table altering and that would change a lot more. TNX for your description. I'm not a Coder, but i understood the problems that may arise by changing only a little part of the code. Found a bug? in the 230-160 Beta with writing Memory. For Example: Freq is 3576.500 KHz on RIG and TRX-control. Frequency is rounded to .000 in the Memory List when using M-wri Button. Exporting to .csv, modifying the Freq and importing the Modified List shows the correct Frequency. And a small glitch i noticed while playing around with the Memory's. My TRX is a ELAD FDM-DUO SDR. It's not in Hamlib but uses the Kenwood TS-480 Command Set. The TRX could go very low in Frequency on receiving. So i noticed, the lowest Frequency shown in the TRX-control Window is 20 KHz. Okay, most Rig's can't go deeper. The ELAD does. It goes down to 0, okay no real receiving, receiving starts around 10 Khz. The RIG sends the Frequency to CQRLOG but the TRX-control Window shows the Frequency's only above 20 KHz. Forgetting the decimal part of frequency might be property, not bug ( as they say in windows world). I will check that next time I open the source. It is very likely that frequency is either read as full MHz or that decimals are cutted after reading. 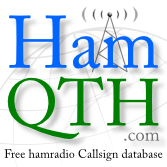 In normal ham radio usage It does not matter if you get 3567 or 3567,5 kHz from memory. Whar comes to low frequency it ts very rare, as you say, that rigs go under 20kHz. I think most rigs become deaf before that limit. Have you checked that hamlib shows under 20k? When connected tune to 10k and type f (enter) to console. What it says? You can close console with q (enter). This is because you are using ts480 plugin. While still having console telnet connection give \dump_caps (enter) to see what rigctld knows about ts480. There are frequency limits. Do they start from 0? Please try beta-109. 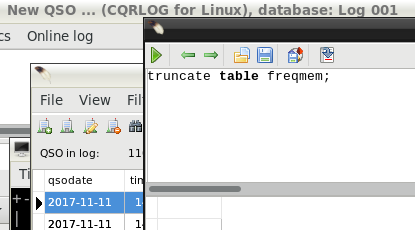 It has now separate memory list for frequencies that can be open while other operations are done with cqrlog. It also has "info" field (25chr) for memory frequencies. (THIS ALTERS DATABASE, DO YOUR BACKUPS FIRST!). Qso list scrolling problem fix (#2) by Andreas, DL7OAP, is also included. Please report bugs & what it feels like. First look seems okay. Very nice. Only one small glitch with the Info Field. Switching between Memory's using M up and M dwn Button does change the content of the Info Field. Using Double Click with open Memory List doesn't. Only the Frequency is changed. The Info Field stays on the last Memory Info you changed to with the M+ and M- Button. For Example: Changing Memory with the Buttons to M 112 (Memory List may be open or not). Now open Memory List (if not open yet) and do a Double Click on Memory M 110. The Frequency changes but the Info stays on M 112. Or whatever is written in the Info Fields. Yep. At the moment small info field does not update when double click line is issued. When clicking up dn buttons it should, always. But as memories are mode related with up dn buttons it was making test more complicated and I did not check it carefully enough. Thanks for report I will check the info field update to be active always when change is done. Maybe also "MW ok" should appear there, not to frequency display (it disappears so fast if rig polling rate is high). one more small glitch. The Mode is not set. I can switch Modes in the TRX Control Window, but M+, M- or Double Click in the Memory List does not set the Mode as written in the Memory List. It stays in the last Mode setten from the TRX Control Window. Im sure it works for me. That I have tested so many times. But I will chek again. Yo could activate rig control debug messages from preferences and look if it tries to set mode. I have to keep few days break for keyboard usage because of my hands. Just cheking messages with tablet. Just tested 109. Mode changes as set in memory list. When double click list line freq and mode is changed as expected. With M-up M-dn buttons should be remembered that memories are categorized by mode. See revised help (with 109 zip) Operation/TRXControl/NOTE. Even when editing bandwidth (AM in test case) too wide 100000Hz or too narrow 20Hz it did still change right frequency and mode with IC7300 when double clicked corresponding line. I think its the communication with my rig. It uses the TS-480 Protocol but not all of them is working as it will do with the TS-480. No big Deal. From the Mode Buttons, Communication is okay. Switching to AM, rig reports AM back. Switching to SSB from the the Memory List or from the M+, M- Buttons, rig stays in AM and report AM. Rig Protocol is TS-480. Rig is a Elad FDM-Duo. Maybe there is a difference in sending Mode alone or in combination with Frequency Change. There is no mode "SSB" to select. This dump is made when memory list is double clicked. Note the fault bandwidth with AM (only 20Hz) still results ok.
And even if I manually edit mode to be SBB (that does not found from selection list) rig changes mode to USB (when freq goes to 28mhz). there is a little problem with importing a Memory List from a .csv File. No Memory is set before importing the List. The First Info Field stays empty (it isn't in the .csv File) and all other Info Fields are sorted + one. Error in my .csv List? There was small typo causing info field shifted by one step. I'll fix it during weekend. At the moment, it isn't possible to switch between different Memory Lists, using the Import function, correct? The Import adds them to the existing List and the List grows bigger and bigger. A "Delete all Memory's" Button would be nice if possible, so you can switch between different Lists using the Import Function. Found out that same when testing latest fix. How ever button did not come in to my mind. that SQL Sequence will help a lot. Thanks.